PUZZLESPLANET WISHES ALL PUZZLES ONLINE LOVERS A HAPPY NEW MONTH! WATCH OUT FOR A SPECIAL NEW MONTH MESSAGE ON SATURDAY006 SERIES! Welcome to the mid-week edition of your favourite puzzles online site. Trust the week has been fulfiling for you and you are coasting to victory! Puzzles online is not Liverpool FC, yet we assure you that you shall never walk alone! We shall be with you every step of the way to ensure you stay mentally fit with puzzles online. Are you ready for today's mental fitness road walk?....it is brief but scintillating. 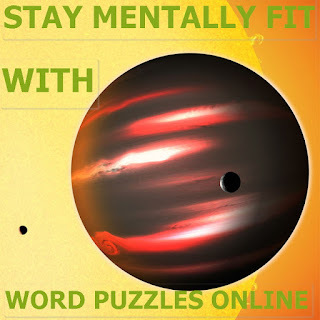 And that was the brain training exercise word puzzle Thursday006 series. The promise was that it will be brief but scintillating.....hope it kept to that promise.....cheers!